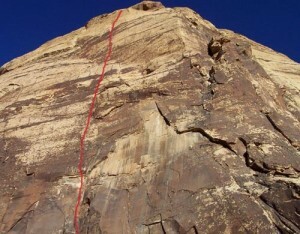 Levitation 29 has long been named Red Rock’s best climb. Stellar and varied climbing up a deceptively long but sometimes vague crack system, Levitation 29 is impressive and intimidating. Starting over 1,000 feet above the desert, and near a drop-off into the Painted Bowl, Levitation quickly takes on major exposure with Las Vegas spread far below. Which SuperTopo guidebooks include a topo for Levitation 29? FA: George and Joanne Urioste, Bill Bradley, 4/81. FFA: Lynn Hill, John Long, Joanne Urioste, 5/81. Due to Joanne’s efforts, they knew the route would go free; all that was required was a strong team to make a clean lead of it. As it happened, John Long and Lynn Hill were in town and living for the time at Randy Grandstaff’s rambling ranch house that during its era was something of a climbers’ nerve center. An invitation was extended and a plan was made. John and Lynn would join Joanne for the free ascent, while George would jumar the fixed ropes and take photographs. With a team of such high caliber, the free ascent was accomplished with no problems. The quality of the climbing was so high that this route became Lynn Hill’s selection in Mark Krause’s book 50 Favorite Climbs, which ironically left out Joanne’s name as a member of the FFA team. There is a further irony. Each time that George has climbed the route since, there has been some activity to distract him from a pure free climbing effort. He is either drilling the bolts, or taking the photos, or cleaning the fixed ropes, or most recently, replacing the old bolts with new strong ones. So, although there is probably no other climber that has expended more energy on the route than George, he has not yet climbed the route free! With new bolts, Eagle Dance is destined to become a classic.